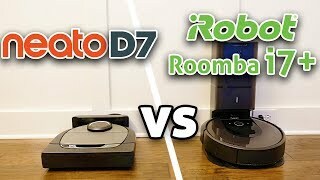 The Roomba i7+ is equipped with one side sweeper, advanced silicone rollers, has strong suction and a 500 ml dustbin. All these things work together to agitate debris, dust, and dirt from hard floors and carpets. The Roomba i7+ has smart carpet identification. Once the robot recognizes carpeted flooring, it boosts air power to its max level. When the machine leaves the carpet, it returns to standard cleaning mode. The best feature about the i7+ is its self-emptying charging dock. It holds contents of up to 30 dustbin size. You need to empty it about once a month, the robot does everything else automatically. There is dirt detect that automatically provides deeper cleaning on high-traffic spots. 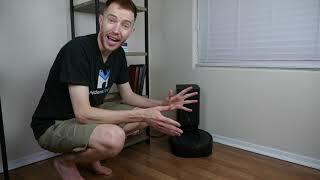 Same as with the Roomba 960 and 980, the Roomba i7+ is equipped with a full dustbin indicator. When the container inside the vacuum gets full, the cleaner docks itself gets emptied and continue cleaning. Inside the Roomba i7+, there is a built-in camera sensor. It scans the surroundings to create a map of your room, so the vacuum knows where exactly to clean. After the plan is created, the i7+ moves back-and-forth in straight lines methodically cleaning one room after another. The Roomba i7+ is suitable for bigger homes with carpets and bare floors though it does not mop. Perfect for pet hair thanks to its brushless rollers. The carpet boost, good climbing ability, and strong suction make the i7+ perform well on carpets up to 20 mm height. Most significant improvements the Roomba i7+ gets is the ability of zone cleaning. When the robot creates a map, you can divide it into areas, name each and schedule the vacuum to work on a specific zone. The robot stores up to 10 different floor plans which makes it suitable for multiple-level houses. 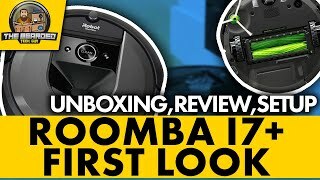 The Roomba i7 is the same Roomba i7+ only it comes with a standard charging dock. You can buy the self-emptying station separately. In the box, you get a dual virtual wall barrier that keeps the robot from wandering.